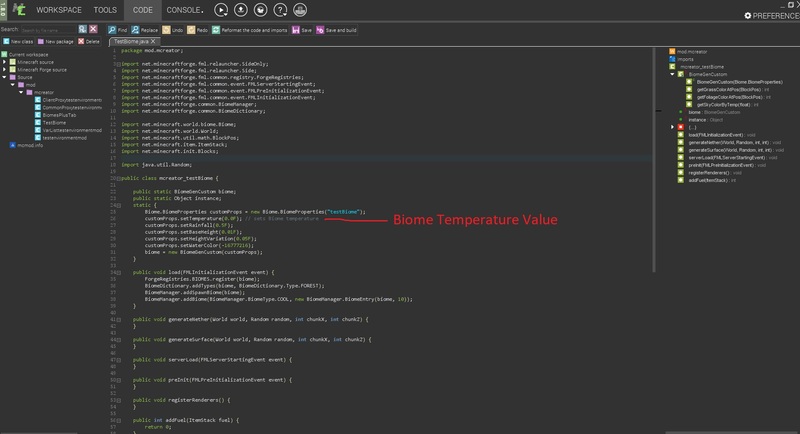 Placing this value below in code sets the biome temperature, a temp of 0.0F means cold with frozen water and Snow, 2.0F means a desert with no rain! Thank you for the suggestion. We will implement this in the future updates. So the warm/cool/icy etc. biome type doesn't affect biome temperature? that would be right. the existing temps are just to say in what grouping of biome types the biome will spawn in. with what ellingtonisland suggested it would be possible to make your biome spawn with the desert and savanna but have the water constantly freezing. Raol: this setting is only for the biome generation, so warm biomes are spawned together, and between warm and icy, there needs to be a cool biome to make temperatures of biomes realistic.